One of the greatest joys there is to being a parent is witnessing the excitement and delight our children have when picking up his or her first musical instrument. This is because we know what a wondrous journey mastering a guitar or piano or other musical instrument can be. We know how receptive young minds are to new experiences and how music helps the brain develop in children. But a problem that sometimes arises is how to keep that young mind engaged when the novelty of picking up that first instrument wears off. 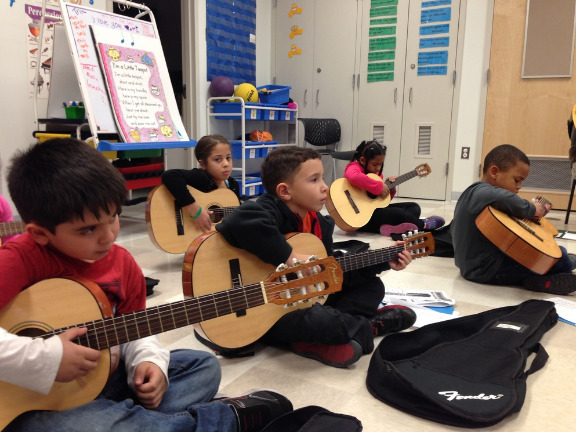 How do you keep your child engaged enough to continue practicing and developing her relationship with her instrument? Here are some tips on encouraging your young ones to practice every day. Assess if your child has the discipline for taking music lessons: Is your child old enough to focus on one thing for more than a few minutes? If not she may not possess the discipline it takes to learn an instrument. If she can, consider sending her to experts who are knowledgeable about keeping young minds interested in learning music. Timing is everything: Make practice a part of their every day routine. There is a time for homework, a time for TV and a time for dinner. Schedule practice for a time between events that cause your child to be stressed such as homework, chores, etc. Game-ify learning: Make up interesting and fun games with your child and then integrate those games into her practice. Give your child feedback: When your child plays a piece correctly for the first time demonstrate genuine excitement at her accomplishment. Conversely, when your child makes mistakes comfort her and let her know that this is a normal part of learning. Don’t let one or two of your child’s missteps discourage either of you. Don’t make it seem like an obligation: By setting arbitrary practice times, you child may begin to view practice as an unpleasant chore. Vary practice times and let them take breaks where they can play video games, snack etc. At our Miami Music School we know how to keep learning fun as it should be in order to keep young minds interested in the wonderful gift of music. Our piano lessons, guitar lessons, cello lessons, violin lessons and singing/voice lessons in Miami are designed by experts who work with children on a daily basis and know how to give them all the tools they will need to enjoy a lifetime of making music.